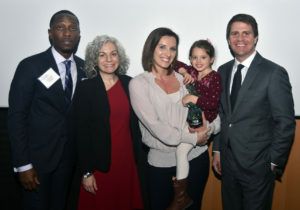 United Way of Central Carolinas (UWCC) announced the winners of the inaugural Young Leaders Awards during a ceremony at the NASCAR Hall of Fame on Wednesday, February 6. A total of eight individuals and groups were celebrated for their hard work and dedication to the greater Charlotte community. The event was presented by TIAA and hosted by United Way’s Young Leaders group. The Young Leaders Awards were created to recognize standout young professionals and groups making a difference in the community – from civil servants and neighborhood champions to nonprofit professionals and social innovators. Following a multi-round vetting process involving United Way staff and the Young Leaders Council, the eight winners were chosen from more than 125 nominations from the community. United Way’s Young Leaders are a group of young professionals ages 21-40 collaborating on philanthropic, volunteer and leadership initiatives. Members advocate for the health and well-being of our community’s children and families, while creating innovative engagement and educational opportunities in the areas of health care, mental health, nutrition and fitness. Young Leaders Council and served as a board member of United Way of Central Carolinas (2017-2018). summer with an initiative to improve education statewide by connecting rural and urban teachers.